Augmented Reality is now a reality. Never have trouble finding airports again! All you need is an iPhone or iPad, no fancy hardware required. FlyQ InSight is the new, absolutely amazing augmented reality aviation app for the iPhone and iPad. Using just the camera in your device, it magically overlays live video with markers showing the position and distance of nearby airports! Never have trouble finding airports again, even in poor weather or night flying! InSight shows incredible views and a simple tap captures the image. Use the Photos tab to view and share your favorite pictures via Facebook, Instagram, Twitter, etc. Filter by type of airport and distance range. Use the unique 2D view to show a "top down" view of nearby airports in relation to where you're pointing your device. Note: FlyQ InSight is for iPhone and iPad only. FlyQ Pocket, which does not include Augmented Reality but is otherwise similar, is still available for Android. FlyQ InSight also combines airport information, weather, fuel prices, and flight planning into a quick, simple app that runs on your iPhone or iPad. Now you can plan a flight on your iPhone with an auto-router that wind-optimizes your flight to get you there as fast as possible. Victor Airways, GPS Direct routing, Jet Airways — FlyQ InSight is ready for it all. Flight plans, aircraft profiles, and pilot profiles are automatically and instantly shared with FlyQ EFB on the iPad so you can work on whichever device is convenient and have it effortlessly available on all your other devices. Using FlyQ InSight is simple because all major functions are always just a tap away. Start FlyQ InSight and within about 3 seconds it finds the nearest airports and displays succinct weather, fuel, and operational details about them — without even tapping a button. Or use the Search feature to find airports by ident or name. Even browse by state/city to select airports without typing. Want more info about an airport? Tap and all the details you need (but no excess clutter) appears instantly. 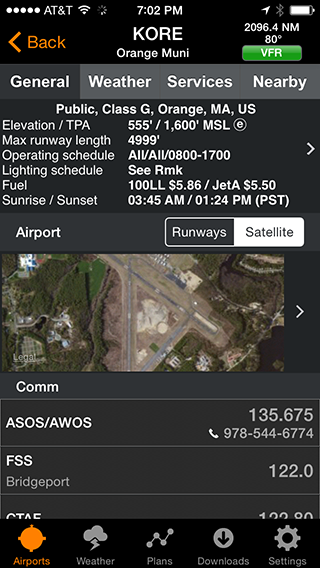 On the first airport page, you immediately see operational information, runways, the FAA airprot diagram, navaids, and an embedded satellite map image of the airport. Want to call the local ATIS? Tap the phone number and you're quickly connected. Tap the weather tab and see the current temperature and sky conditions, a Nexrad radar image of the area, the nearest METARs and TAFs, winds-aloft, and even an official Lockheed-Martin or DUAT weather briefing. 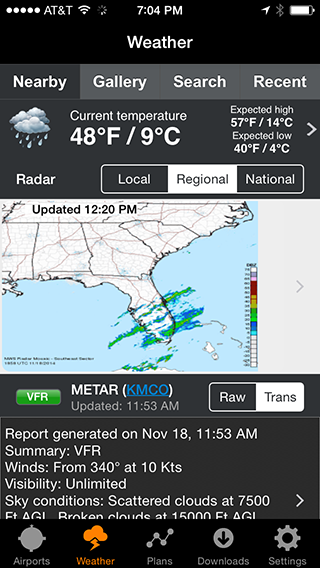 Best of all for those of us who aren’t 21 anymore, one tap zooms the METARs, TAFs and weather graphics to full screen, large font versions that anyone can read—even in turbulence. Another tap gives you an easy-to-read 7 day forecast. 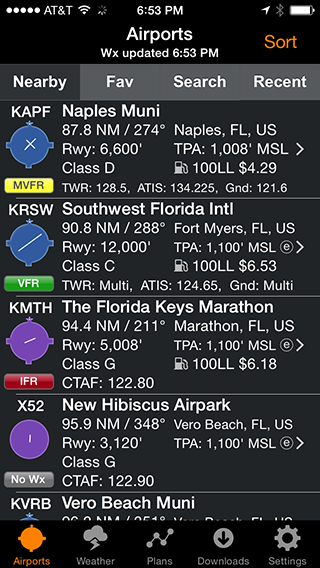 The Favorites feature gives quick access to commonly-used airports. FlyQ InSight shows the detailed airport diagrams produced by the FAA. This applies to virtually all Class B, C, and D airports. 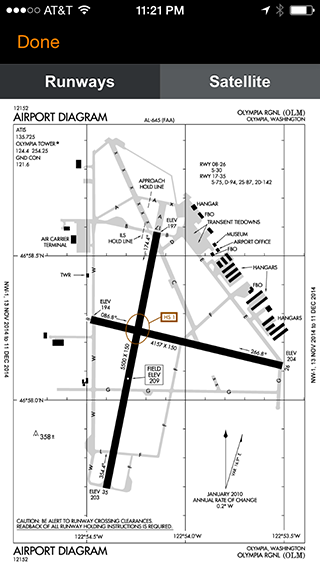 Where the FAA does not produce a diagram, AOPA-provided runway diagrams are used. 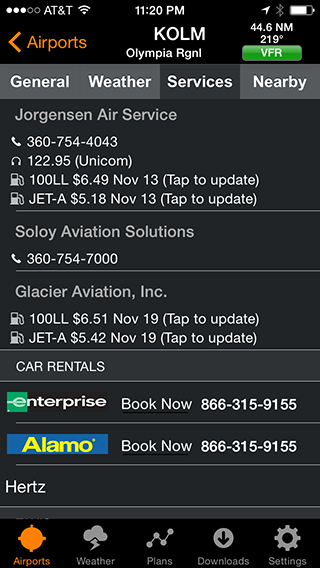 Quickly find the FBO details you need—fuel information, telephone numbers, rental cars, nearby attractions and more. Version 2.2 displays up-to-date fuel prices for more than 2,500 airports. And if you find an ever newer price, a quick tap lets you update the system so other pilots know what you've found. Tap the Weather tab and FlyQ InSight uses your device's GPS to lock-on to your location and get the current temperature and sky conditions, a Nexrad radar image of the area, the nearest METARs and TAFs, winds-aloft, and even an official Lockheed-Martin weather briefing. All with just one tap. One tap zooms the METARs, TAFS, and weather graphics to full-screen, large font versions that anyone can read -- even in turbulence. 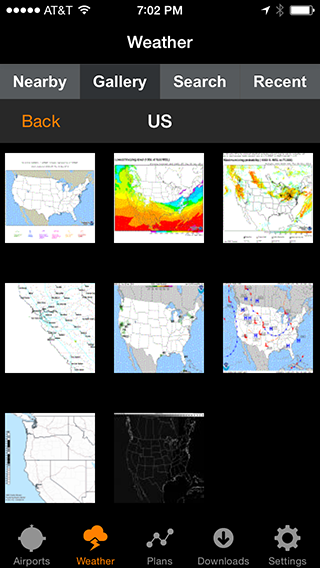 Use the Gallery tab to view hundreds of US and Canadian weather graphics, many of which are animated. 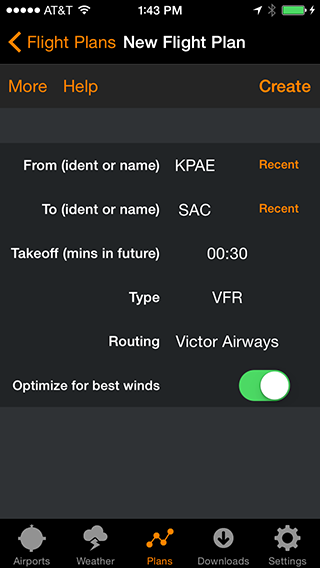 Of course FlyQ InSight keeps track of your recent selections for quick future access and stores graphics and METARs/TAFs on the phone so they're available even when you're not connected to the Internet (such as in flight). No time to plan a flight? FlyQ InSight assembles the perfect wind-optimized flight in about 30 seconds. Tell FlyQ InSight where to depart, where to land, and how to fly there (Victor Airways, Jet Airways, or GPS Direct) and FlyQ InSight does the rest. FlyQ InSight even remembers your recent flights and home airport so you can often plan a flight by picking from a list of recently used airports rather than typing. Best of all, flight plans created here are instantly available on FlyQ EFB (and vice-versa) so your backup is always in-hand. In just a few seconds, FlyQ InSight plots the whole course including all the navaids and intersections - not a simple straight line. 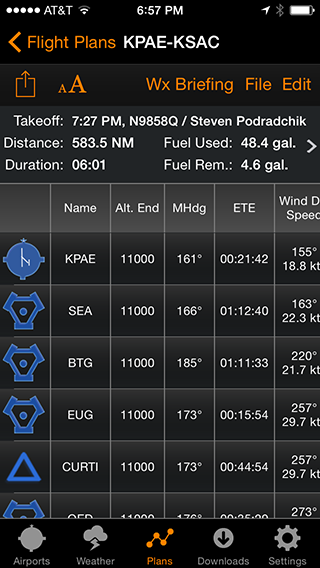 It even uses the winds-aloft forecast to give you the ideal altitude for each leg. FlyQ InSight automatically requests an official Lockheed-Martin or DUATS weather briefing so you're good to go. And since filing the flight plan takes one tap and about 3 seconds, it's easy and quick to fly safely. In fact, if you don't like entering flight plans into a GPS, FlyQ InSight wirelessly transmits the whole flight plan to the amazing Aspen Connected Panel for use in your Garmin GPS.